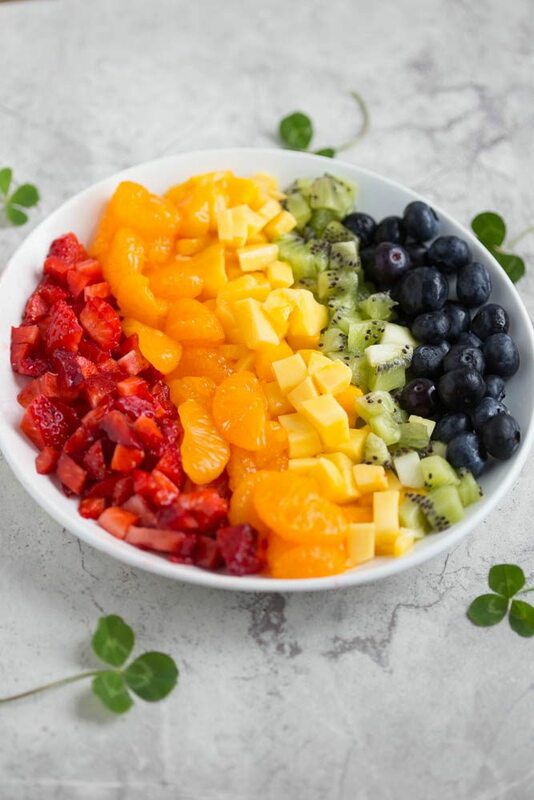 Personal rainbow fruit pizza cookies are an excellent way to celebrate St. Patrick’s Day without sickly green food dyes, alcohol or heavy Irish entrees! Perfectly sturdy, chewy sugar cookies are topped with a sweet and tart key lime cream cheese frosting and showered with a rainbow of fresh fruit. 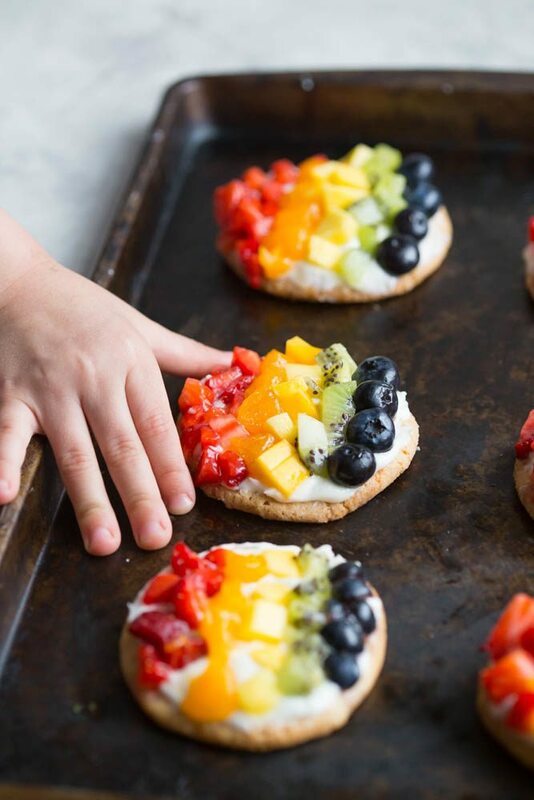 These personal fruit pizza cookies are your pot of gold! Y’all remember personal pan pizzas from when you were a kid? I’ll never forget the bubble of excitement that erupted from my belly when my parents packed us in the car and took us to the local pizza parlor for supper back in the day. The golden crust of those personal pan pizzas oozing with delicious pizza grease are a super fond memory from my childhood. As mentioned above I may as well be 85, and I don’t get down on St. Patrick’s Day like I used to. This past weekend the St.Patrick’s Day shenanigans were in full force for our little area of town, and let me tell you…I had hot flashes and sweat beads forming on my brow just from looking at the pictures of sloshing kelly green beer and heavily bearded millennials in top hats and leprechaun onesies. I had to make these bright and sunny personal fruit pizza cookies in order to clean away the grime and grit I collected from scrolling my Facebook feed. If you do still like to get down for St. Patrick’s Day and need to feed a crowd or if you’re looking for a fun bit of luck to serve up to your kids classmates, then these fruit pizza cookies are a super fun way to celebrate the day! The hardest part about this recipe, if you can even call it that, is chopping up the fruit into little pieces, but even that doesn’t take very long to do. I chose to use strawberries, mandarin oranges, mango, kiwi, and blueberries, but feel free to use any fruit you’d like. There isn’t a wrong answer here. 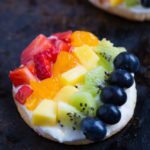 The base of most fruit pizzas are usually made with sugar cookie dough, and these fruit pizza cookies aren’t any different. These cookies have that nice crunchy bite on the outer edge, but are soft and chewy in the middle. The key is not to over bake them! Remember cookies will continue to cook on the tray after they are pulled from the oven so you’ll just want to bake them until they are barely brown. Another great thing about this recipe is that they are super kid-friendly and fun. Allowing kids to spread the cookies with the to die for key lime cream cheese frosting and then letting them put on the fruit themselves is fantastic for their hand/eye coordination, imagination and self-esteem. They are usually super proud of their masterpieces! 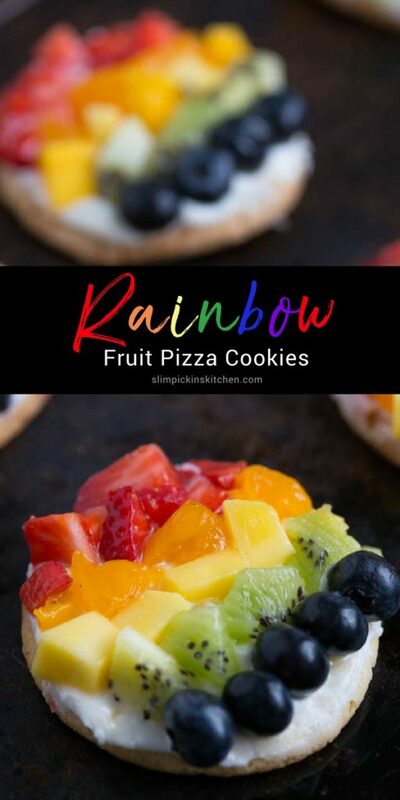 Personal rainbow fruit pizza cookies are an excellent way to celebrate St. Patrick’s Day without sickly green food dyes, alcohol or heavy Irish entrees! Perfectly sturdy, chewy sugar cookies are topped with a sweet and tart key lime cream cheese frosting and showered with a rainbow of fresh fruit. 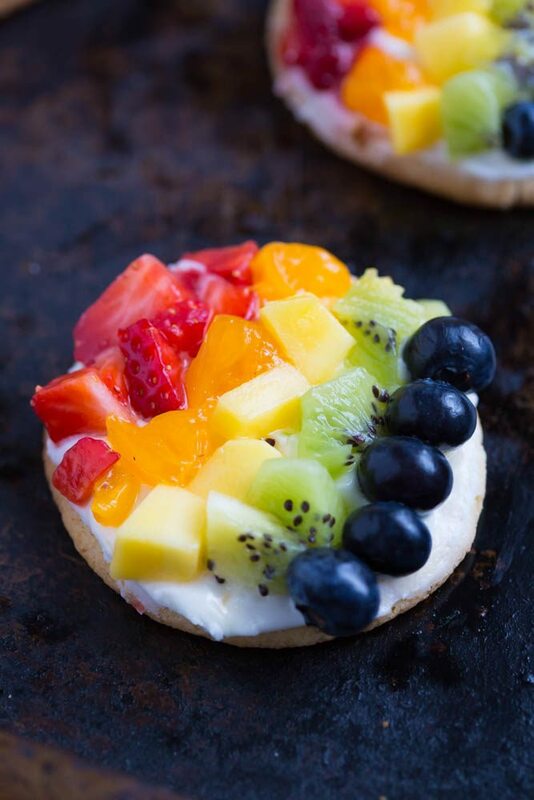 These personal rainbow fruit pizza cookies are your pot of gold! Line cookie sheets with a silicone baking mat or parchment paper and preheat oven to 350 degrees (F). Using a stand mixer with the paddle attachment or a hand mixer, cream butter and sugar on medium-low speed for 2-3 minutes or until light, fluffy, and pale. Add egg and gently mix until well combined. Stir in flour mixture and vanilla and stir until just combined. Drop by the tablespoonful, spacing 1.5 inches apart, onto prepared baking sheets and bake for 8-10 minutes or until very lightly browned. Remove from oven, allow to cool on trays for 5 minutes, then remove to resting racks and allow to cool completely. While cookies are cooling, prepare the key lime cream cheese frosting*. Top cooled cookies with a thick layer of key lime cream cheese frosting and fruit. Using a clean bowl and the whisk attachment for the stand mixer or a hand mixer, beat cream cheese and butter until light, fluffy, and smooth. Turn speed to low and gently stir in powdered sugar, one cup at a time, until smooth. Beat in lime juice and vanilla until thick and creamy.